Also (but less important), I'd replace that 1 TB HDD with a 500 GB SSD. The hyperlinks in the prices should help you find the best deals. I get 35fps after 30minutes in ARMA2 CTI missions on ultra because of all the AI. I got 30 fps with a i5 4590. What can i expect to get on ultra settings in arma3 is the AI coded the same? 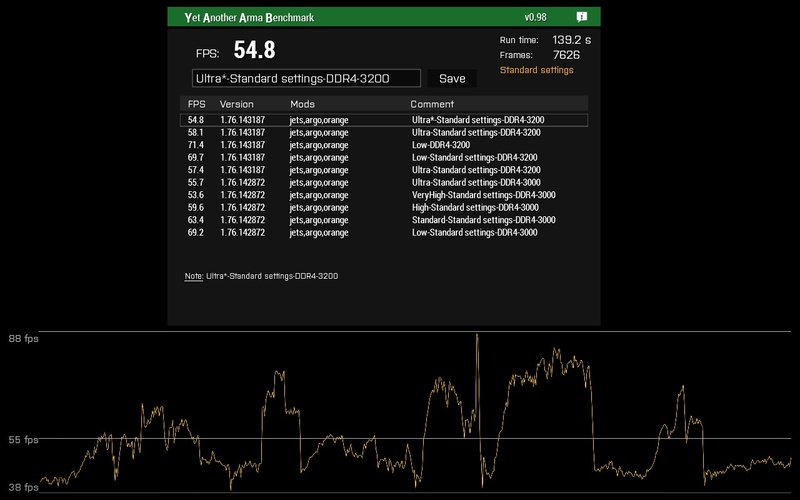 FPS in Arma* games are mainly related to how fast and efficient is your CPU. In Arma2, in order to get a better FPS level try to tweak the "Visibility" parameter. This parameter is 100 % CPU dedicated, so go to 1600 m and have a look. But, of course, having a GTX 1070Ti helps to get Ultra quality for textures and objects. So you will get the same FPS level in Arma3. AI computing is still a CPU job. In Arma3, having a GTX 1070Ti will help more than in Arma2 to enhance overall PC performances with an entry level CPU. In order to play CPU Intensive missions you must have the most intense CPU you can get. That's why I switch from i7-4970 to i7-7700K 3 years ago. In Arma3, the AI is rather sophisticated with a very interesting and advanced code behind, the main problem in that area is that Real Virtual Engine doesn't allow any way of parallelism in computation. There are also limits for the total amount of AIs in a mission at the same time, because the game is tracking each one individually even when it has been killed. That why in my own missions, I will always stay under the 250 AIs limit, and I am extensively using garbage collection. Actually there was something that I noticed with Nvidia GPUs in that they need a faster CPU to run better because it runs extra threads for it to push more draw calls. AMD uses LESS CPU overhead so you might get away with less CPU cores. I tried to disable HT with this 1060 GTX and loss FPS! If you are going AMD, try to disable HT and OC the cpu better. It might be more efficient and can save some money. I was wondering if anyone had an Intel i3-8350K (quad core coffeelake)? Those OC crazy high - 4.8-5.0 GHZ and I wonder if it was paired with fast ram and AMD GPU like 580 or better, would it run ARMA faster than with Nvidia GPU due to Nvidia using up cpu threads? Seriously considering to buy one of those to have a mobile ArmA3 device to visit friends. its 8cm x 15cm x 15cm and AsRock annonced to claim 120 USD for it in the US. Thats dirt cheap given it comes with case, board and PSU. It fits the 2400G which according to Youtube does pretty well in ArmA3. Of course, I have tried to play without any GPU, using the AMD Radeon Vega 8. Whatever the settings for the memory, the results were not good. We already know that ARMA3 is extremely sensitive to the quality and management of memory. In this case, I think that the memory sharing between the CPU and the IGPU does not allow Arma3 optimal operation. While I was doing these tests without external graphics card, I also made several game tests with Argo, and there I have to say that the performances were pretty good. This is also shown on the YouTube video. I’ve been offered a good deal on a laptop with an i7-8750H and GTX 1050. How well it would run at 1920x1080? What sort of detail settings are realistic? That should run OK if it has FAST RAM. But its a laptop so I am unsure of the screen resolution and how much RAM you can fit into it. ARMA uses everything, CPU and GPU so even the mighty Nvidia 2080Ti runs within a few % of the AMD GPUs. That means the AMD GPUs are just as good with a good CPU and fast RAM. If you can find a used Vega, that may be a good way to get save money and put that into a faster CPU that you can OC. It will play just fine, depending on the mission. The really heavy scripted content or mission with lots of mods are going to struggle, but you can usually mitigate this by turning stuff down. Aim for the top of middle and adjust from there would be my advice. Does this machine have an SSD and if so, is it an M2? If so, you're going to see that technology at it's best. What speakers does it have? Laptop speakers are almost always terrible. +1 for @Valken RAM comments. Hey guys. My current system is i5 2500K + GTX 1060 6GB. I've had it overclocked to 4.4Ghz for like 6 years. I think the CPU is slowly dying as the PC has started freezing twice a day and I've tried changing every component aside from MOBO and CPU. Memtest always comes out fine. Does this seem like a good choice? As far as ARMA goes, I actually play multiplayer but mostly just hosting smaller games in LAN. My 2500K is already pretty good for this but the 9600K should be even better. As much as AMD is better for multicore stuff it just doesn't cut it in ARMA from what I've seen. The 9700K is way too expensive around here and I think an i7 8700 non K would also be worse in my case considering I don't stream etc. 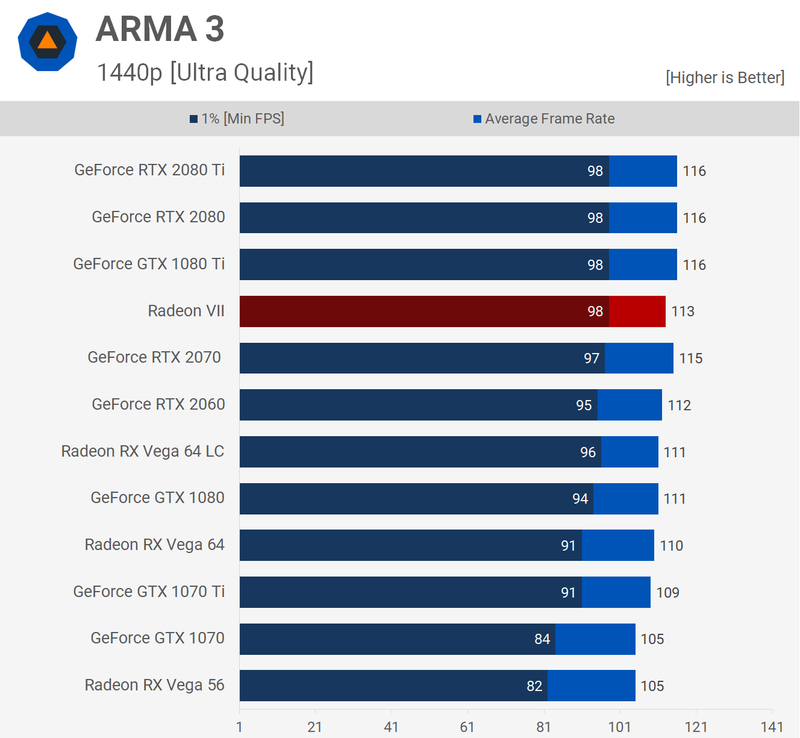 The 9600K has really good results in ARMA in pclab reviews, is there a reason I shouldn't get it? I will be using my 1060 6GB to play at 1440p but high-ish details are fine, it doesn't have to be ultra. Thanks. @ Boomerang Trotter : from my point of view, the choice of an [ i5 9600K Z390 /16 GB 3200Mhz DDR4] based rig looks OK and the GTX 1060 6GB is just what you need to play. Nevertheless, you can also consider the [Ryzen 5 2600X/ B450/16 GB 3200Mhz DDR4] option. Thanks @Valken and @Tankbuster for your replies, I bought the laptop. I guessed it would be around mid settings, once I’ve reinstalled windows I will find out. It does come with an SSD which I understand is PCI, Unfortunately it’s only 128GB. There’s is also a SATA hardrive which I will swap to an SSD. In in terms of memory it has 8GB of 2666MHZ which I plan to swap to 16GB. The machine will have a secondary use as a dedicated server / headless client. I will use faster ram if supported. It’s a slightly odd spec and probably why I was able to get a good deal. The GTX1050 from what I’ve read can’t handle AAA games although very few AAA games actually interest me. The 1050TI option would have better resale value. Just Googled the SSD model number and it’s a M.2 drive. @Mack.Good luck and get the fastest ram you can possibly afford to buy. OC the CPU if possible during gaming to maximize ARMA. Check your PSU. My last 2 major PC problems were PSU related. Blew a Corsair HX850 (I think lighting storm took it out) and RM1000 (have no idea)... I got a HX1000 and it handles all the OC. The PSU is the heart of your system... keeps the blood (electricity) flowing and the capacitors DO wear out over time. 6 years is a good run. Way beyond your warranty. What RAM speed do you have and how much? I upgraded RAM from DDR3-1600CL9 to DDR3-2400CL10 and that nearly increased my FPS by 20-30 (50-60 FPS), which is almost 70% from ~28-30 FPS average! You can go back a few post to see my RAM timings. I think your GPU is good enough at your settings, but if you want Ultra at 1440p, you probably want to look at Vega or 1070 Ti. Not sure if you want to put that much money there unless you play other games that needs it. Also, I think ARMA series, Fallout and Civilization are the only games that needs FAST CPU w FAST low latency high bandwidth RAM combos. Most games just wants more GPU power. 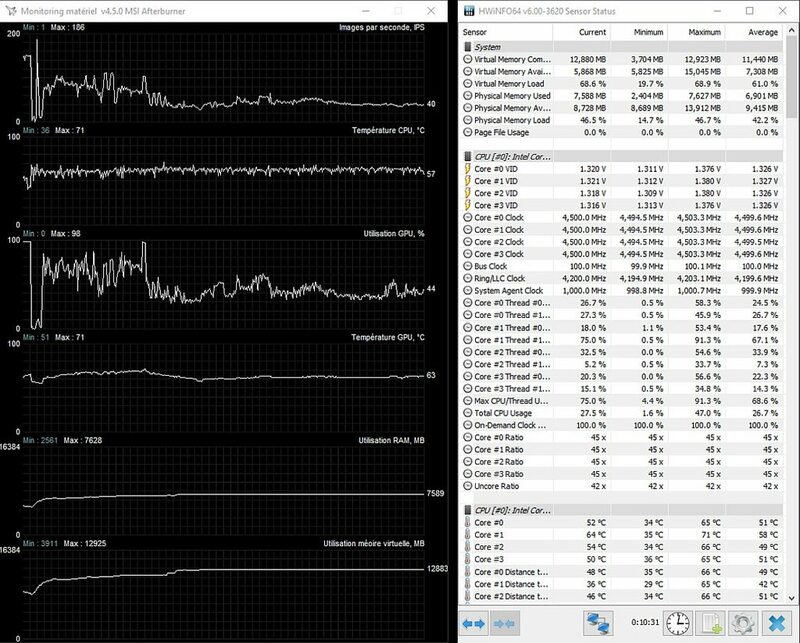 Battlefield (Frostbite), Metro and Crysis/CryEngine are the few that needs a lot of cores. So it really depends on which game you play the most before you upgrade. Question for people with loads of RAM: what is the peak usage the game gives you? I have 8gb and it starts HDD swapping. Arma* has always been susceptible in terms of memory and its management, now and since 64-bit platform release, it has also become extremely greedy. So, yes in game, nearly 8 GB of Physical memory are used for Windows 10 64 and Arma3. Screen shot made on the spot using my gaming rig #1 [i7-7700k/GTX 1060 6GB/16 GB 3200MHz DDR4] on my "2vs1" SP mission test. More than 120 IA are fighting each other in Pyrgos in a 100% vanilla mission. In the Ryzen 2200G / Arma3 small test I have done and released on French CanardPC forums, you can see how much Arm3 is sensitive about memory management [using Vega igp] and even if physical memory usage can be limited, virtual memory usage is going up to 90% (12 GB). Old Bear is correct. His example above show that ARMA uses up to 13 GB RAM at its peak. I have witness out of memory error at 16 GB when I use mods. I use a TON of mods but its mostly ACE + addons + effects like Blastcore, Enhance Movement and etc... not really graphics mods... just functional mods. I now have 32 GB of RAM and have NO PROBLEMS so that means ARMA can exceed 16 GB of physical RAM for its own process. I am on Windows 7 - I don't play any DX12 game yet... does not even matter as my GPU can't handle it but it is good enough for ARMA in DX11 mode. I quick follow of my results with my new laptop incase it is of interest to anyone thinking of buying a similar laptop. Vanilla Arma 3, only changed graphics preset, didn't use the build in "Standard" setting in YAAB. 2 runs conducted at each setting. Elevating the laptop about 1cm made a big difference in cooling and stopped any throttling. Soon I will up the RAM to 16GB and see how well it can run a dedicated server and two headless clients. I ran YAAB during the free weekend and this is what i got with the ultra preset https://imgur.com/GUCrkV8. It really is the same the as ARMA2 . I also got 64fps during the first missions of the campaign and 50fps during multiplayer warfare missions! [off mode on] About YAAB Standard settings. I strongly suggest using them when you are doing tests in order to get a minimum stability in order to compare real performances in game. 1° In Arma3, you will never "get stable 60 FPS". In Arma3, with a PC specifically built for this game such as my #1 rig [i7-7700K/GTX1060 6GB/16 GB 3200 MHz DRR4/ 2x500GB NMVe SSDs] I am playing in the 25/110 FPS range with huge and fast variations related to events and environment. You can get a look at the kind of variations you can expect in the YAAB thread like these. 2° Most of the "startup parameters" are inappropriate, ineffective and some are counter-productive. 3° Unless you understand clearly what you are doing and why, using a custom memory allocator is not a good idea. 4° Mixing [RHS Escalation, CUP -Terrains,Vehicles,Weapons,Units ,NATO & Spetsnaz vehicles,weapons, Blastcore:Phoenix,Advanced Combat Enviroment,MCC4] Mods in a mission is very bad idea. I will suggest to test the whole pack without ACE and/or MCC4. You must test a vanilla configuration and use a minimum set of Mods and Add-ons. 5° Using Auto detect in order to set your video settings is a good start, but you must probably have to lower the Visibility parameter to 3000 m in order to enhance your FPS level. 6° Using a laptop, even a rather good one, in order to play Arma3 can lead to limitations in performances. As an example, the standard Max Turbo Frequency for the i7-8750H is 4.10 GHz [Intel] but a laptop OEM can limit frequency in order to help the cooling management. I just installed ArmA II on this new computer (well, new to me) and it is running fine, as far as I can see. I may, or may not, be adding any mods in the future. Right now though, I am pleased with how the game is working.